Scott Sumner asked (in comments on his post on AD) if the information transfer model (ITM) was better at predicting inflation (gray line in the graph above) than TIPS spreads (the difference between inflation indexed treasuries and ordinary treasuries of the same maturity, red jagged line in the graph above). The TIPS spread on a given day represents the market's future expected average inflation over the maturity of the treasury (we'll use the 10-year). Well, the ITM is better -- about 5 times better. Actually, the ITM was better at predicting inflation even though the worst economic crisis since the Great Depression intervened! 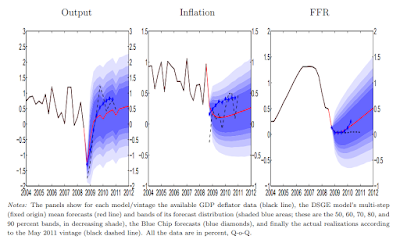 I fit the ITM model to 1960-2006 Q4 data and then did a log-linear extrapolation of NGDP and M0 (currency in circulation) starting in 2007 to predict inflation from 2007 to 2014 Q1. That's the blue line in the graph above. The 10-year TIPS spread from Q1 2007 represents the market's best guess at the average inflation rate over the next 10 years, and so should also represent the average inflation rate from 2007 to 2014 Q1. That's the red straight line. The ITM model average difference from 2007 to 2014 was -12 basis points, while the TIPS model was on average off by +66 bp. 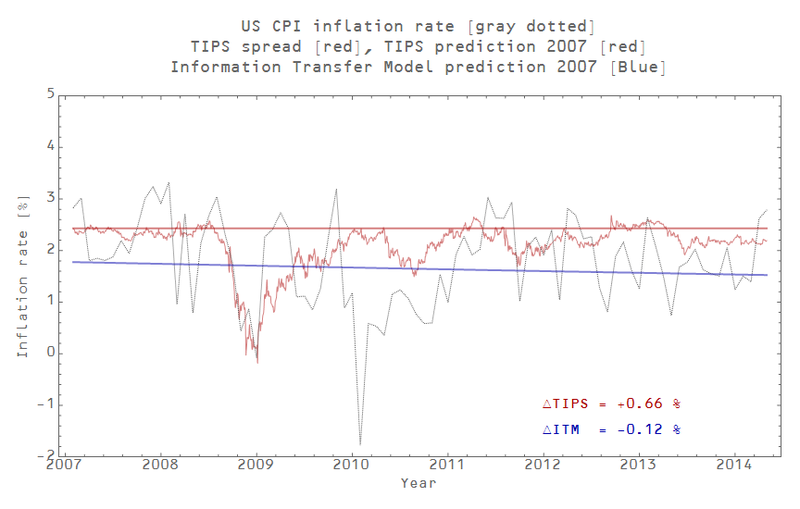 The ITM prediction from 2007 was a better predictor of inflation in 2013 than the TIPS spreads from 2013! The ITM model falls apart in the last couple months, but then the past couple months only represent a couple CPI data points. 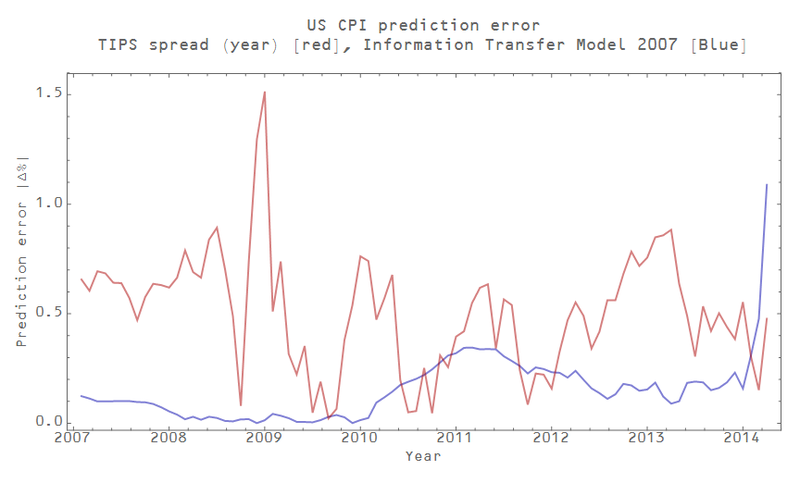 The ITM model represents a long run trend, so its predictions will have a higher error over short runs of data. The market random guess TIPS spread is better at short runs because in the short run, inflation this month is about what inflation was last month. PS It seems the TIPS spread is a good predictor of the TIPS spread though. Nice... and fast turn around too! Jason O/T, I'm always confused about how to think about the kappa=1 scenario. Trying to imagine the theoretical sequence of events that get's an economy there breaks down at kappa = 1 for me. I can perhaps think about it in terms of a discrete time system, with noise or quantization errors, and assuming the implicit market based targeting CB realizes the difference between kappa < 1 and kappa > 1 (i.e. that when kappa > 1, they need to sell securities to raise P, since dP/dM0 < 0). Is that implicit in your endogenous solution? That the CB realizes the sign of dP/dM0? If that's the case then I see a normal inflation targeting CB moving, say from kappa < 1 up closer to 1, and all the while the size of their OMPs need to get bigger and bigger to keep on target. Because of the discretization in time and noise, they may cross over to kappa > 1 and then need to implement large OMSs... but they'll tend to converge to kappa=1, won't they? All the while the size of their OMPs and OMSs get large and stay large (or continue to get larger) as they converge to a narrow locus of points on either side of kappa = 1. 1. CB's don't realize when dP/dM0 < 0? But if that were the case it seems like they could very well start a process of rapid deflation (as P shrinks, they increase M0 more, causing P to shrink further). That doesn't happen, right? 2. Economies don't really cross the kappa=1 boundary, or if they do, then NGDP changes tend to automatically throw them back before the CB has a chance to cause accelerating deflation (assuming again that the CB doesn't realize that dP/dM0 could ever be < 0). I think situation #3 is likely. In Japan, they actually gave up and set their inflation target at 1% for awhile. Only economists worry about low inflation, so there isn't going to be a big public outcry. As you get towards kappa ~ 1, the inflation you see is almost entirely due to NGDP growth, not base growth. The P(M0) curve is actually really flat past the point where dP/dM0 = 0, that is to say when dP/dM0 is really small. It looks like a bell curve, but in log space. In linear space, the front edge of the bell is really steep, but the back edge is really flat. That means rapid deflation won't happen (#1) -- it's just gradual. Regarding #2, I've been considering the idea that when economies reach dP/dM0 = 0, economic shocks suddenly have no monetary policy to buffer them. They just hurt the economy more and more until the economy collapses or something intervenes. The US went over the dP/dM0 = 0 line, and what resulted was the Great Depression and WWII. Also, the dP/dM0 isn't always at kappa = 1; it is actually a curve with different values of kappa and sigma (in the link above). "that is to say dP/dM0 is really small"
... leaving out the when.